Flash of brilliance. 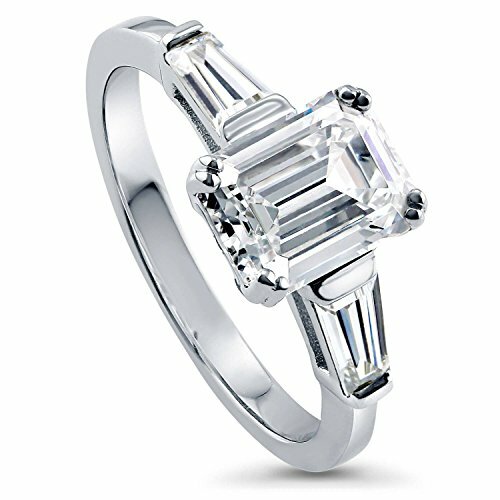 This sterling silver ring adds irresistible shine to your ensemble, courtesy of a prong-set, emerald-cut cubic zirconia DIAMONBLISS Cubic Zirconia center and channel-set tapered baguette DIAMONBLISS Cubic Zirconia on either side. The DIAMONBLISS Jewelry is the great choice for women in almost occasions and holidays such as, New Year Eve, Valentine's Day, Wedding and other Anniversaries. 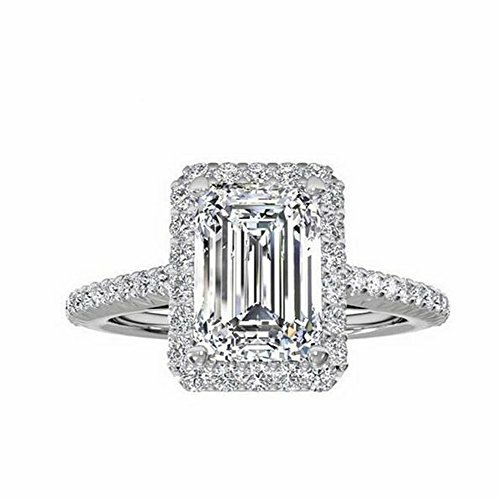 An emerald-cut DIAMONBLISS cubic zirconia takes your breath away, while trapeze-cut DIAMONBLISS cubic zirconia flank the center stone and add to the piece's grandeur. No one needs to know how affordable this ring was. It'll be our little secret. The DIAMONBLISS Jewelry is the great choice for women in almost occasions and holidays such as, New Year Eve, Valentine's Day, Wedding and other Anniversaries. 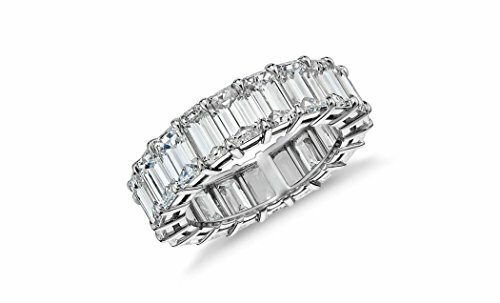 Reach a new level of timeless glamour with our 18Kt White Gold Emerald-Cut CZ Eternity Ring. Tasteful and elegant, it features a double band and is plated in white gold. A perfect way to add polish to an everyday outfit or infusing dazzling glimmer for a special occasions. Grab this deal for your love and watch their eyes sparkle. This 3-stone ring offers a playful combination of simple and vogue with its dual stone cut center design. Made of rhodium plated fine 925 sterling silver. 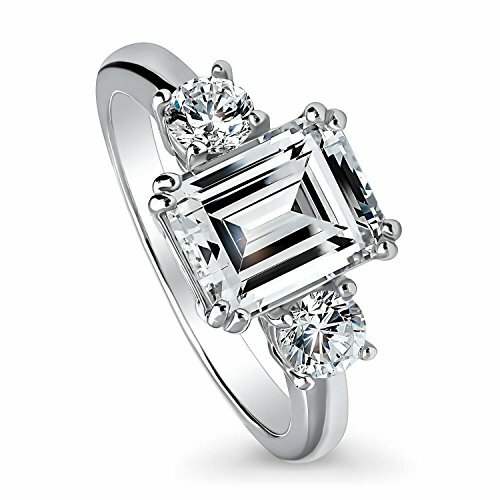 Features 2.62 carat emerald cut clear cubic zirconia (9mm x 7mm) in 4-prong setting. Accented with 0.5 ct.tw round cut clear cubic zirconia in 4-prong setting. Band measures 2mm in width. Imported.Care Instruction: To clean the metal, it is recommended to use our signature jewelry polishing cloth that is infused with a special jewelry cleaner. You can also use a soft, 100% cotton cloth. It is recommended that you have one cleaning cloth for gold and a separate one for silver. To clean the stones, soak the jewelry in a small bowl of warm water that is mixed with dish detergent; you can also gently brush the stones with a soft bristle toothbrush.DO NOT use silver liquid cleaner to clean rhodium-plated jewelry. Please take off jewelry when swimming or doing other physical activities. Put on jewelry after applying lotion, hair spray, perfume or other chemicals.DISCLAIMER: All cubic zirconia stone weights are approximate and listed as diamond equivalent weight in carats. Jewelry is not intended for children under 13 years of age. Photos may be enlarged to show details. All product measurements are approximate. This solitaire ring will add an instant touch of subtle brilliance to your wardrobe with its regal luminosity. Made of rhodium plated fine 925 sterling silver. 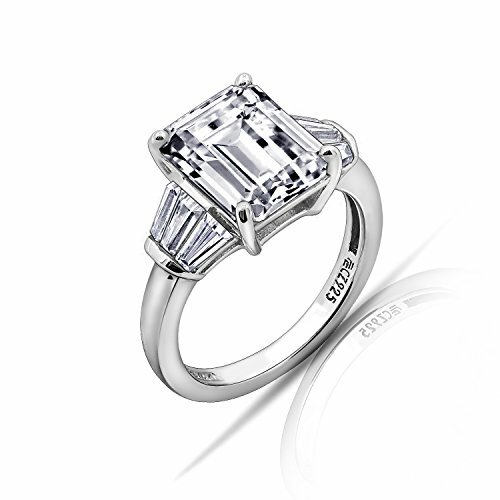 Set with 2.17 carat emerald cut clear cubic zirconia (8.5mm x 6.5mm) in 4-prong setting. Band measures 2mm in width. Imported.Care Instruction: To clean the metal, it is recommended to use our signature jewelry polishing cloth that is infused with a special jewelry cleaner. You can also use a soft, 100% cotton cloth. It is recommended that you have one cleaning cloth for gold and a separate one for silver. To clean the stones, soak the jewelry in a small bowl of warm water that is mixed with dish detergent; you can also gently brush the stones with a soft bristle toothbrush.DO NOT use silver liquid cleaner to clean rhodium-plated jewelry. Please take off jewelry when swimming or doing other physical activities. Put on jewelry after applying lotion, hair spray, perfume or other chemicals.DISCLAIMER: All cubic zirconia stone weights are approximate and listed as diamond equivalent weight in carats. Jewelry is not intended for children under 13 years of age. Photos may be enlarged to show details. All product measurements are approximate. 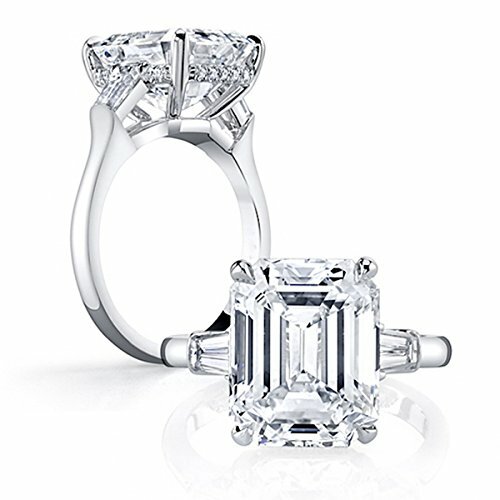 This 3-stone ring exposes the striking brilliance of a regal, classic style. Made of rhodium plated fine 925 sterling silver. 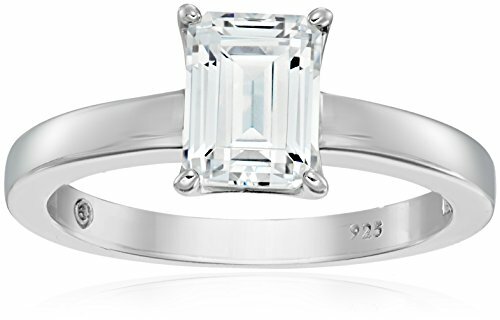 Features 2.17 carat emerald cut clear cubic zirconia (8.5mm x 6.5mm) in 4-prong setting. 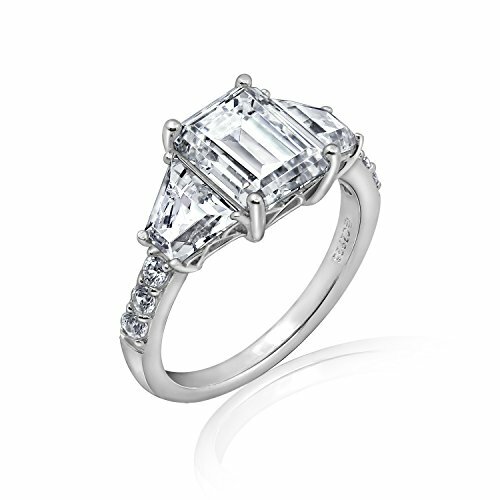 Accented with 0.24 ct.tw step-cut trapezoid clear cubic zirconia in bar setting. Band measures 2mm in width. Imported.Care Instruction: To clean the metal, it is recommended to use our signature jewelry polishing cloth that is infused with a special jewelry cleaner. You can also use a soft, 100% cotton cloth. It is recommended that you have one cleaning cloth for gold and a separate one for silver. To clean the stones, soak the jewelry in a small bowl of warm water that is mixed with dish detergent; you can also gently brush the stones with a soft bristle toothbrush.DO NOT use silver liquid cleaner to clean rhodium-plated jewelry. Please take off jewelry when swimming or doing other physical activities. Put on jewelry after applying lotion, hair spray, perfume or other chemicals.DISCLAIMER: All cubic zirconia stone weights are approximate and listed as diamond equivalent weight in carats. Jewelry is not intended for children under 13 years of age. Photos may be enlarged to show details. All product measurements are approximate. 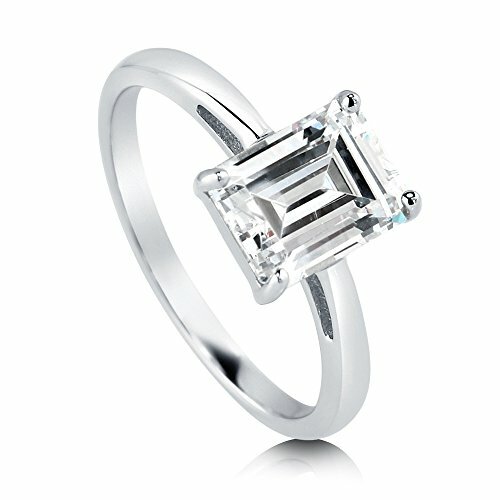 Looking for more Emerald Cut Cubic Zirconia Ring similar ideas? Try to explore these searches: Flying Rhino, Beneful Prepared Meals, and Persimmon Knitting Yarn.